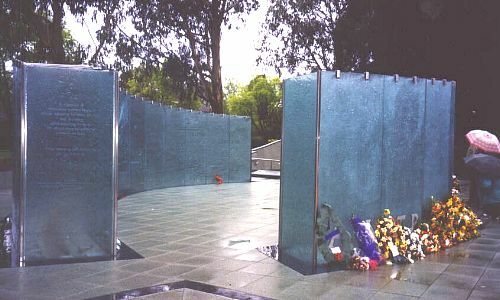 Dedicated on Saturday, 2 October 1999, on Anzac Parade in Canberra, was the Australian Service Nurses National Memorial. A competition for the design of the Memorial was held and the winner was Robin Moorhouse who lived in Rabaul between 1958 and 1963. Her design is based on the phrase from a letter written home by a World War l nurse - "dying soldiers just wished to be held". Talking to Robin about the design, she said that reading the book White Coolies and having lived in Rabaul where war evidence was still around, were strong influences on her concept and decision to enter the competition. A jeweller and silversmith, now a sculptor, Robin sees the Memorial as a "jewel on the landscape" and that "glass was chosen for the walls as it is a living material and also reflects life. It is as timeless as women caring for men during wartime. The Memorial is a celebration of nurses' lives, their courage and compassion". 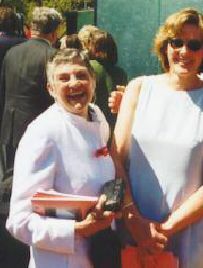 The decision to visit Canberra for the weekend to attend the opening and dedication of the Australian Services Nurses Memorial by myself and a friend, both of us being nurses, had long been made. What a weekend it turned out to be, a weekend full of surprises, meeting old friends and making new, stories and the emotion of the ceremony. Long overdue, the Memorial takes its rightful place on Anzac Parade and acknowledges service nursing over the last 100 years from the Boer War onwards. Arriving on Friday in drizzling rain, our first thought was "we hope it doesn't rain tomorrow" so we decided to check out the site. Driving up Anzac Parade and past the site of the Memorial, we could see frantic preparations going on, the last minute rehearsals and finishing touches. From a distance, in the rain and not knowing what to expect, we saw this low slung elongated structure that seemed to be covered in green canvas. Low slung, yes, but green canvas, no. When we returned on dusk, with only a Security Guard and interested visitors like us, we were able to have a closer look. The green canvas turned out to be glass, thick (25mm) and consisting of sculptured etched panels. The Security Guard informed us that each panel cost $10,000, and there are sixty. We stood and marvelled that glass would be so expensive. Of course it is very special safety glass. Somehow, standing back, the Memorial seemed in marked contrast to the other more masculine memorials on Anzac Parade. One enters the Memorial on the north side from a slight ramp. The curved lines of the panels lead one through to a contemplative space at the southern end where there is a low waterfall and sunken garden. We returned to this again on Saturday and on Sunday. As we walked through, cast into the back panels was a scenic collage depicting the zones where nursing service was given. Overprinting named these places so well known to us, for example, Gallipoli, Salonika, Singapore, Banka Island, New Guinea and Rabaul. Although not of any specifically recognisable place, some of the nurses visiting appeared to recognise several of the scenes depicted. Likewise myself, the tropical scene depicting Pacific areas caused me to remark "I know where that place is", it was a small peaked mountain with a harbour below - readers can decide where that might be. For my part, I had to have a photo of that section. The lights illuminating the Memorial came on and so I was able to get the photo, rain and all. Opposite, cast into the inside front panels were nurses depicted from the Boer War onwards in their uniforms of the day with hand written extracts from the personal and poignant accounts of nurses etched into the glass. The front panel facing Anzac Parade simply says "Beyond all Praise". Leaving, we decided wet weather gear would be needed for the service next day and resolved to be at the Memorial very early to get a seat. Saturday 2 October dawned and we remarked "someone from above must have decided that this was a special day" - yes, it was dry and sunny. Off we went early to find we were not alone and already at 8:00 am the site was buzzing with people, buses and taxis arriving. Service personnel were directing people and handing out the Order of Service and a booklet of nursing service titled Just Wanted to Be There. No seating seemed to be reserved for non-service nurses like us, however nothing ventured, nothing gained, so we decided to sit in the back corner of one of the stands which proved to be a good move as we had an excellent view of the whole proceedings. The Memorial itself, in the sun, looked soft and cool. Ex-Army nurses arrived, some in their Association uniforms with medals glistening in the sun - nurses, we could see, are a highly decorated group. As we watched these women arrive (they came from every State and Territory as well as New Zealand, United Kingdom and the USA), the joy of reunion was evident. Two ex-Army nurses came and sat next to me and we recognised each other from having met at an Army nurses' luncheon. It turned out, chatting as one does, that the husband of one of them was Warwick Rowell who served in the AIB on small ships in PNG waters. After the war he was involved in clearing mines as well. Digressing, Warwick rang me on return to Sydney to tell me he keeps in touch with some surviving members of Lark Force. Warwick also said with admiration "those Coastwatchers were indestructible". Just as proceedings were to commence, there was a "vroom" and "roar" of motorcycle engines on the other side of Anzac parade. We all turned and saw a large contingent of the "Vietnam Bikies" from all over Australia parking their motorbikes on the grass before coming over to watch the proceedings. There they were, in their leather jackets, emblazoned with a skull and slouch hat atop. I could not help but be moved when chatting to a group of them afterwards, one of them said to me "we come every two years to rededicate the Vietnam War Memorial and we decided to coincide the visit with the dedication of the Nurses' Memorial". Continuing, he said "we wanted to be a presence but it is the nurses' day". I asked this group of somewhat burly men what they thought of the Memorial and the reply astounded me. "It is beautiful, calm and gentle, so different to the other masculine memorials." With that, they all went off to their special memorial. The ceremony commenced with the Master of Ceremonies, Ita Buttrose (an excellent choice), welcoming us and giving an overview of what was to come. 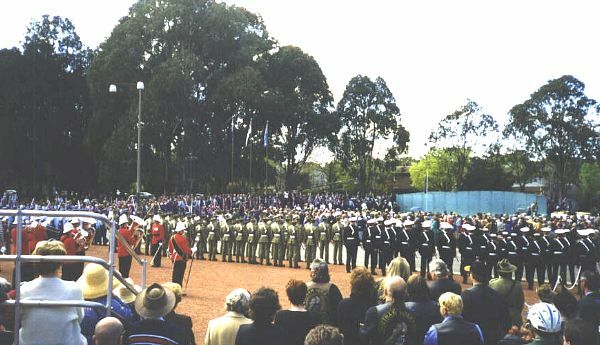 The Honour Guard, comprising cadets from the Australian Defence Force Academy, took up their positions between the two stands. Their drill was faultless. Behind them stood the Duntroon band whose playing was likewise faultless and behind again, sat the choir. The Prime Minister, the Hon. John Howard MP, arrived followed by the Governor-General, Sir William Deane AC KBE. After inspecting the guard and band, the Catafalque party was mounted. This honour was given to four service women. Not having witnessed this before, the slow drum beat, the orders and the positioning of the party at each end of the Memorial, heads bowed with rifles at rest, set the scene for me of what was to follow. For those like myself not aware of the significance of the Catafalque party, it originally signified the guarding of the coffin to prevent desecration and theft. In pride of place were six ex-POW nurses. Of special interest to PNG people was the presence of Lorna Johnston (née Whyte), who was one of the six army nurses taken prisoner in Rabaul in 1942. Along with civilian and missionary nurses captured at the same time, she spent 3 1/2 years as a POW in Japan. Hearing that this amazing woman was there I determined I had to meet her and did so at the luncheon later on. Next in order came the Flag Bearers march past. The procession of 103 flags were in remembrance of 102 nurses who died in conflict, the extra one being for civilian nurses who also died. Leading this parade were nurses wearing uniforms from the Boer war to the present day. I could not believe my eyes, the leading nurse in the Boer War uniform was an old friend from University days. The flag procession, accompanied by the band playing, moved slowly and reverently through the two inner panels of the Memorial. The flags forming an arching effect evoking spontaneous clapping from the assembled throng. Then followed a report of the years of planning culminating in today's Memorial dedication by the Executive Director of the Royal College of Nursing, Ms Elizabeth Percival AM. The Prime Minister followed and spoke movingly as he acknowledged the service and compassion of nurses over the last 100 years up to the current contingent serving in East Timor. The Governor-General, assisted by ex-Army nurse, Brigadier Perdita McCarthy, unveiled the Memorial. Brigadier McCarthy had a long and distinguished army nursing career. 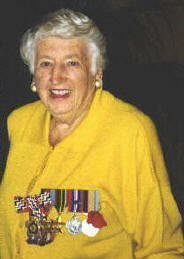 Serving in PNG, she was at Jacquinot Bay in 1945. She is the only nurse to have achieved the rank of Brigadier and even though frail but still indomitable, continues to take an active interest in service nurses affairs. The Memorial was then dedicated by the Chaplains with the singing of "Abide with me". The Minister for Veteran's Affairs, the Hon. Bruce Scott MP, read the first lesson with the second being read by the Hon. Graham Edwards MP, representing the Leader of the Opposition. Mr Edwards is a Vietnam veteran, sustaining injuries that resulted in the loss of both legs, his mobility is now a wheelchair. Reading from the Gospel of Matthew, Chapter 5, v 1-10, the words were compelling and concluded with "God blesses these people who are treated badly for doing right. They belong to the kingdom of heaven". Lorna Johnston and Pat Darling laid one of the many wreaths, theirs being on behalf of the POW nurses. During the wreath laying the choir sang the "Captives Hymn"; at this stage, as you can imagine, there was hardly a dry eye. This hymn, the harmony of which represents the sounds of an orchestra was composed and sung by a choir formed in Banka POW camp. The composer, who was also the choir leader, died in captivity just prior to the war's end. At the completion of the wreath laying, the Ode was recited followed by the "Last Post", one minute's silence and then the "Rouse". A fly-past by the RAAF Roulettes, the singing of the National Anthem, the dismounting of the Catafalque party (how did they stand so still for so long) and the general conclusion followed. After the dedication we spent some time chatting to other nurses before going to the Ainslee Function Centre. Well what a luncheon, there would have been at least 1200 persons there on two floors. Can you imagine the stories? We were seated next to some WA nurses and the story of their family typifies what was occurring all day. The youngest sister, by many years, was accompanying her oldest sister for the weekend. 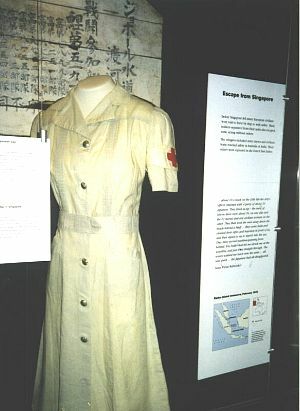 During the war the oldest sister was a nurse in Labuan, Morotai and on the hospital ship Wanganella. She was one of five members of this family all serving in the armed services. The youngest sister (a small child during World War ll), also a nurse, just retired, told me the troop trains used to go through the town where they lived to and from the Army centre at Northam. Every time a train came through, mostly at 4:00 am, they would be there. This younger sister said she spent most of the time crying behind the sheds, her mother, she recalled, was very stoic and the only time she saw her mother cry was when she heard that Nurse Vivian Bullwinkel was going to Singapore. "She'll never come back," her mother said. The postscript is of course that Vivian did return, the only one of the Vyner Brooke survivors massacred on Banka Island. Now confined to a wheelchair, Vivian came from WA and was one of the six ex-POW nurses attending the ceremony. For those who may visit Canberra, the uniform she wore when marched into the sea to be machine gunned survived the war and is now on display at the Australian War Memorial, bullet holes and all. Hidden in the POW camp, it was saved to be worn when released from captivity. After a delicious meal I went in search of Lorna Johnston. Having read the story of the Rabaul nurses' capture, internment at Vunapope and subsequently Japan (Not Now Tomorrow by Alice M Bowman), I had to meet this person. After all, we both had strong connections with Rabaul. Eventually I found her on the other floor and introduced myself. We chatted and I was struck by the warmth, vitality and sense of humour of this woman who had endured so much. Lorna mentioned that she had breakfasted with Bert Speer (ROAPNG member) and that he was at the ceremony. We spoke of Mary Goss who was a civilian nurse at Namanula and interned with Lorna. Mary's husband, Tom a NGVR member, was taken by the Japanese in Rabaul and never seen again. I remember Mary looking after me in Namanula Hospital in 1947 when home on school holidays. Lorna said, "you must know Robin Moorhouse, the designer of the Memorial", who also lived in Rabaul. I didn't but I do now. It was a delight meeting Robin, she told me she was a friend of Pat Hopper (ROAPNG member). Robin introduced me to her daughter Felicity Carruthers who was responsible for the computer graphics of the design. Felicity was born in the same malthoid and timber Namanula Hospital. Robin is the sister of David Moorhouse (ex Patrol Officer and ROAPNG member). By this stage, feeling quite overwhelmed by all the events, the time came to leave but not before I had some photos taken of Lorna and myself. Lorna now lives in New Zealand. We returned to the Nurses Memorial again. Now that we knew something of the conceptual ideas, we wanted to take it all in again slowly and read the inscriptions as well as viewing the Memorial in sunlight. We sat in the contemplative area, casting our eyes down the panels and listening to the soft tinkling of the waterfall. We walked along the front reading the cards on the wreaths. Yes, this Memorial is certainly different and unique. Later that evening we attended a function hosted by the Vietnam Veterans' Association where we were treated to yet another feast of food, drink and stories. Sunday dawned and we were back to rain again. Not daunted, back to the Memorial we went to take some photos before going to the service at the Anzac Memorial Chapel, Duntroon. Again we arrived very early to an already crowded chapel. Nurses we observed, are well trained to be on time. The service followed the normal pattern - prayers, hymns, readings. Lorna Johnston did the New Testament reading - such stamina, how did she keep going? Much to my surprise someone I had been looking for the whole weekend read the prayer to our Nation. Dianne Badcock, ex-Vietnam nurse and friend, turned out to be the chaperone or "minder" of, you guessed it, Lorna Johnston. Well of course there was more chatter. So many unexpected connections that occasions like this bring out into the open. Leaving the service in pouring rain, our next stop was the Australian War Memorial as there was a photographic exhibition of Army nursing that we felt we had to see. In need of sustenance we diverted to the War Memorial café symbolically called "Poppies". Walking up the path we passed a bronze statue of Edward Weary Dunlop as an older man. How fitting, as this enriched a weekend already overflowing with emotion. The photographic exhibition included among others, some photos of the Rabaul nurses. Continuing, we visited the World War ll section primarily to see Vivian Bullwinkel's uniform. The World War ll display has been revamped, it is now done in sectors and all exhibits are in chronological order. Another surprise was the story of Lark Force, the Tol massacre and details of the sinking of the Montevideo Maru. Around a corner was a section dedicated to the Coastwatchers. Displayed were the medals and some memorabilia of Alan Roberts, ex Coastwatcher and Director of District Services and Native Affairs. We saw Vivian Bullwinkel's uniform - it was all there, bullet holes, bloodstains and the story. I cannot adequately express my feelings engendered by seeing this uniform, surviving as it has done and now preserved for future generations, and reflected on how much it represented: courage, compassion, tenacity and survival against all odds. We drove back to Sydney (it was still raining) in quiet contemplation of the events of the weekend and marvelled at the spirit of all the thousands of nurses who visited Canberra for this important dedication.